Demand control ventilation is not a new concept, but traditional approaches have failed to deliver energy efficiency results reliably or consistently. Aircuity solves the issues of traditional DCV systems and more, delivering a "Healthy DCV" solution for both energy savings and comfort. Conventional DCV solutions deploy many discreet sensors throughout a facility, with another sensor placed outside for reference. Unfortunately, these sensors quickly lose their accuracy, and this error is magnified when two inaccurate sensors are compared to one another. Aircuity's approach uses a single sensor to test both indoor CO2 and outside air, providing a true and accurate CO2 differential measurement – with zero sensor error. 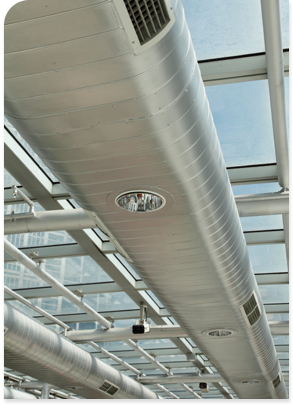 Optimizing ventilation based on varying occupancy is a great way to reduce energy costs, but if other parameters are not also evaluated the indoor environmental quality can be diminished by odours or particulates in the air. Aircuity delivers a "Healthy DCV" solution by sensing other critical parameters such as particulates, TVOC's, or CO if desired.